The last time the Steelers had a losing record was when they went 6-10 in 2003. Since then, they’ve won two Super Bowls, appeared in a third, and made 10 playoff appearances in 15 seasons. It’s as impressive a stretch as any team has put together outside of New England. Over only the last decade, things are good as well, but not quite as good. The two Super Bowl titles came in 2005 and 2008. Starting in 2009, the Steelers have one Super Bowl appearance (a loss) and six playoff appearances in nine years. No losing records on the list, but two years at .500 and a late-season collapse in 2018 still count as a bit of a black mark, considering their established standards. The Steelers are still one of the league’s elite franchises over the last decade, but not quite at the same level as they were in the years before. Let’s take a look at the best Steelers fantasy seasons of the last decade. Remember when I said the Steelers’ last losing season was in 2003? Coincidentally or not, they drafted Roethlisberger that offseason and have never looked back. Because he’s been slightly more brittle than his fellow longtime veterans like Philip Rivers, Eli Manning, Drew Brees, and Tom Brady (missing 16 games over the last decade), Roethlisberger hasn’t dominated Steelers’ QB fantasy scoring quite like those other guys … but barely. The best Steelers QB season other than Roethlisberger over the last 10 years is Landry Jones in 2016 … when he put up a whopping 33.9 points. But it was 2018 that Roethlisberger had his best year, playing 16 games for the first time since 2014 and setting career-highs in yards (5,129) and touchdowns (34) and even tying his career-best with three rushing scores. Not bad for a guy at 36. Bell entered the league six years ago, and 2014 remains the only season of his career in which he has played 16 games. He set a career-high in rushing yards and receiving yards and tied his career-high in total touchdowns that year. Over the four years since, DeAngelo Williams, Bell (twice), and James Conner have all put up top-six Steelers RB seasons in our timeframe. Bell is really good. Being a running back for the Steelers is also a really good thing. 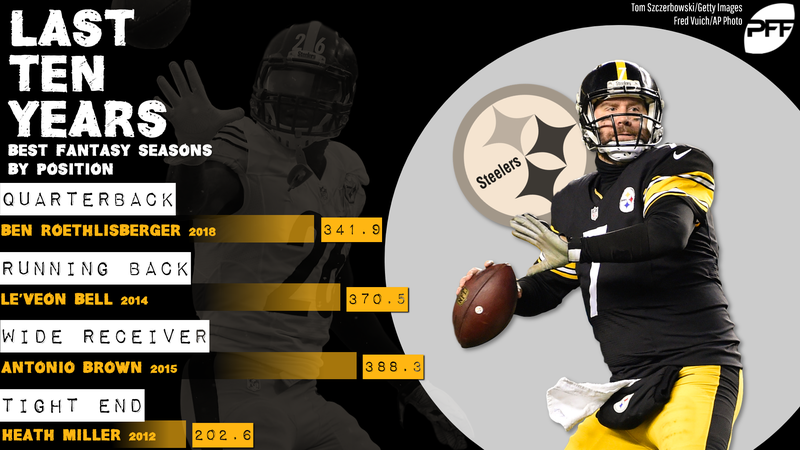 Brown’s 2015 was not only the best Steelers receiver season of the last 10 years, it was the best receiver season in the NFL in that time … and his 2014 was a close second. Brown has been a top-five fantasy receiver each of the last six years, maybe the most dominant stretch for a fantasy receiver in NFL history. That 2015 season featured only his fourth-most single-season touchdowns, but he set a career-high in receptions and yards that year. He’s … really good. For as dominant as the Steelers have been at the other positions over the last 10 years, the team hasn’t exactly run away with tight end production. Miller’s 2012 was the only year in our sample to top 200 PPR points, and he’s the only tight end with a season of more than the 133 points Vance McDonald put up in 2018. Miller was very good! Miller wasn’t exactly great at any point. But 2012 was the closest he came.